​BOOT CAMP training ON US! who wants up to 4 weeks of free boot camps ON US? Now that winter is well and truly here, what better time to get cracking on those health & fitness goals! And that got us thinking.....why don’t we give away some training as a little incentive for you to help with that motivation? Yeee haaa! That's right - if you join our team now, you'll get free training for the remainder of June 2018. Whaaa?? I know right! So the sooner you join, the more free training you'll get! This is only for the first 10 people who jump on this offer. Step 2 – Accept the Ezidebit (direct debit) request to secure your spot (we'll email everything to you once your health form is complete). Your first payment won't be due until Thursday 28th June which will include the joining fee + first weekly or fortnightly membership payment. Step 3 – Come down to train straight away! 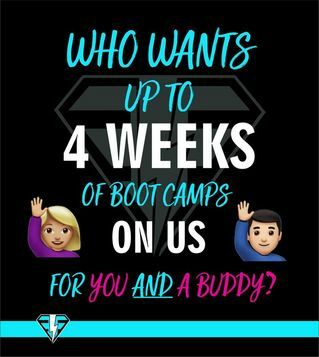 You'll get your joining goodies (singlet, cap & foam mat) and will be instantly welcomed into our team, invited to our VIP Members Only facebook group and you can start working towards your goals right now! Yes of course – if you'd like a test-run before officially joining then you can do the 7 day trial for $10 or 14 day trial for $19. And if you decide to join after this, then the remainder of June is free for them and you.